This project report is for student who want to make project in Road Engineering/Civil Engg. 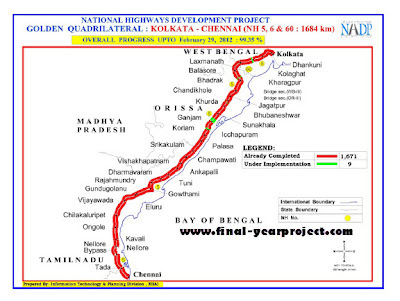 The project will tell you about detail analysis and execution of road construction in India. India's road network carries over 65 percent of its freight and about 85 percent of passenger traffic. National Highway 5 (NH-5) is a major National Highway in India that runs along India’s east coast through the states of Orissa, Andhra Pradesh and Tamil Nadu. You can also Subscribe to FINAL YEAR PROJECT'S by Email for more such projects and seminar. This report includes the detail analysis of road construction and what are the material used in the building of the national highway. Report also include survey method's which are done before construction. Use it for your reference and study work only.